This stamp is from the Wish you were Here stamp set by Happy Little Stampers who are sponsoring this challenge. The winner will get a $15 gift voucher to spend in their store. Our Guest Designer for this challenge is the very talented Valentyna. Her blog Flourishtina is full if inspiring projects. Great design.. I think most people would have placed the dots above the skyline, so to flip it like this adds a stylish element of surprise. How you said so much with just to stamps and colours! It looks beautiful! Enjoy your sunday! 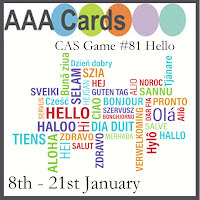 Brilliant CAS card Sandie, it's very expressive and yet so clean i design. I think you've added some cool twists here. For instance, placing the city line at the top of your card and everything else below. Looks great like this! Oh la la...love that fabulous London skyline! Perfect! Love your stylish placement and striking minimalist design. Hi, Sandie - thanks for visiting my blog and subscribing - I hope you will enjoy my cards!!!!! I've been a follower of your blog for quite some time and I really love visiting here - haven't been commenting on any blogs for a while, but I'm hoping to keep up with commenting on a regular basis in future!!!! 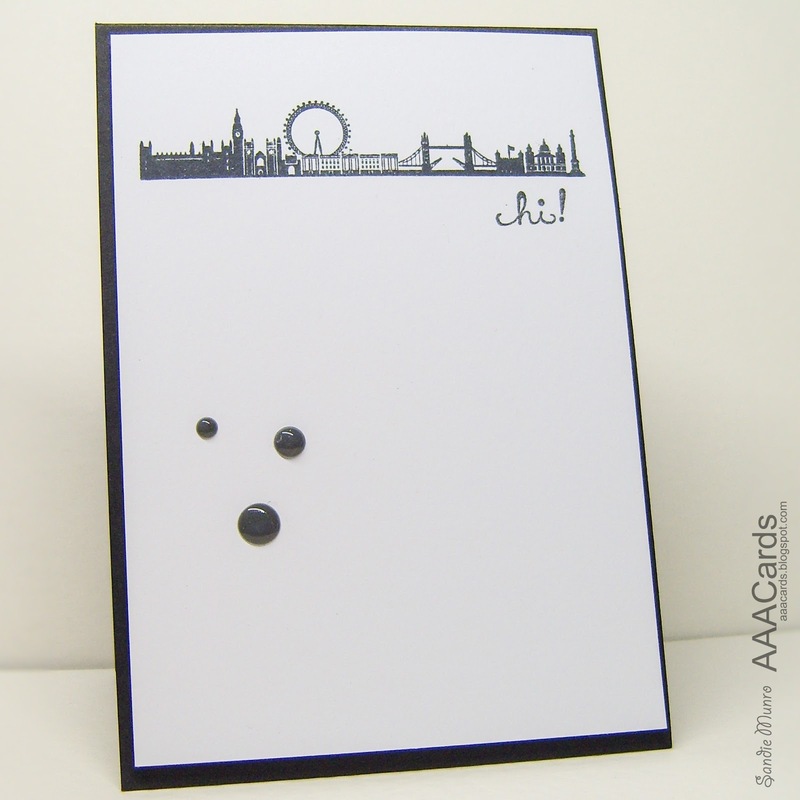 I really love the wonderful London skyline you've got here and how you've kept everything so simple to have a wonderful striking card!!!!! The small little sentiment works so well and the enamel dots have been placed perfectly!!! Such a great card!!!! Amazing card, Sandie! Perfection again! I really like the layout and the sheer CAS-ness of it. Hello to you to and a happy new year Sandie, hope all is well with you. What a striking and beautiful CAS card. How I miss that skyline. 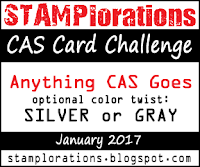 That's a great CAS design and that stamp is perfect for you! This is so pretty Sandie! What a wonderful tribute to your home city. Makes me want to visit! Fabulous design, Sandie! I love how you organized your layout, stunning skyline.